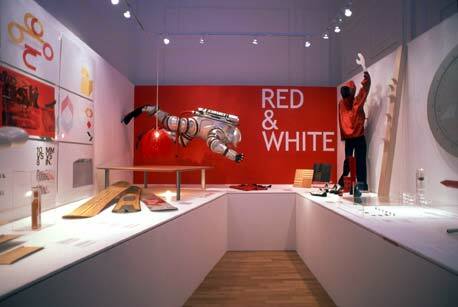 “RED + WHITE: Canadians In Design” exhibition at Canada House in London, U.K., opened September 24 during the London Design Week festivities, and will be on view until January 21, 2005, when it will likely travel to select European venues. Organized by BARK Design Collective, a Vancouver-based community of designers that promotes Canadian design both at home and abroad, this exhibition is its third major project this year. BARK enjoyed critical success at the Canadian Embassy in Tokyo with their “No Apologies Necessary: Design From Canada” exhibition last November. Christian Blyt, one of BARK’s founding members, organized and installed RED + WHITE. “We’re talking about the present and the future, progressive and cutting edge work,” he explains. He also wants the work to have a practical and marketable link to allow the featured designers to forge international contacts with UK suppliers, markets, and potential clients. While the Canadian High Commission on Trafalgar Square leaves much to be desired as an exhibition venue, the work is excellent and wide ranging. “It’s challenging working with the embassy,” Blyt agrees. “The hours of opening, accessibility, and security are issues.” Nineteen designers are exhibited and the objects range from Molo Design’s “Floating Tea Lantern and Teacups” to John Fluevog’s iconic footwear designs to Loyal Loot Collective’s “Coat Hang,” a stylish and modern wood coat hanger. The work is installed in a surprisingly small space – one small room off a corridor of offices and banquet halls. However, on entering the room, clever lighting and exhibition design creates a sense of verticality. The works sit on an elevated plinth – an arrangement that guides viewers into a centralized viewing area, rather than walking around the projects in a traditional wall hung environment. 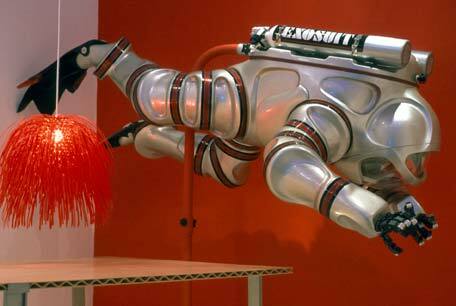 The most eye-catching object is the “Exosuit” designed by Dr. Phil Nuytten, whose high performance futuristic deep-water dive suit hangs suspended over the room. “It’s a grey zone – not art and not commercial products,” Blyt argues as he makes a case for showcasing new Canadian design talent, while giving them a boost into the international marketplace. It is clear that by featuring designers at many stages of their careers, from fledgling start-ups to publicly traded companies, BARK means to break down barriers for Canadians to have their work seen internationally. “We want this exhibition to have some commercial consequences,” Blyt insists. While it gives the viewer just a glimpse of emerging Canadian designers, it is an important exhibition for its focus on innovation in Canadian design in fields such as furniture, product, lighting, and jewelry. It is somewhat biased towards Western Canada, and cannot hope to reveal the design culture of an entire nation, but it is refreshing to see such a well-curated, ambitious, and sophisticated presentation of young Canadian talent. Crucially, BARK’s intent to use this as a way to market and communicate Canadian designers to an international market may result in more of these young designers challenging stereotypes and preconceptions of “Canadians” through successful marketing abroad. Another exhibition at Canada House that coincides with RED+WHITE provides an interesting cultural juxtaposition. Douglas Coupland’s “Canada House” examines iconic Canadian objects from the past and questions constructions and stereotypes relating to Canadian identity. RED+WHITE runs until 21 January at Canada House, London, and it is planning to travel to additional European venues in the Spring 2005. Terri Whitehead is a designer and journalist based in London, U.K.
"RED + WHITE: Canadians In Design"